Six years after the franchise launched, has the Paranormal Activity series run out of steam? 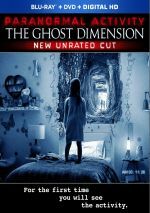 In the US, the answer may be “yes”, as the sixth Paranormal - 2015’s The Ghost Dimension - mustered a meager $18 million at the American box office. That’s $89 million less than the original film earned, and barely half of what its predecessor – 2014’s The Marked Ones - grossed. Add to that poor reviews and weak fan reception and it doesn’t look good for the brand. However, Ghost Dimension made a total of $78 million worldwide. That’s still the weakest performance of the six films, but given the movie’s low $10 million budget, Ghost Dimension turned a good profit, so I wouldn’t rule out the creation of more movies. Apparenrly the series’ producers claim Ghost Dimension will finish the franchise – I’ll believe it when I don’t see it. Though I’ve never been wild about the Paranormal Activity flicks, I felt Marked Ones was the best of the bunch, so I was curious to see if Ghost Dimension continued that upward trajectory. After a quick, creepy prologue from 1988, we jump to 2013 and meet the Fleege family: Ryan (Chris J. Murray), Emily (Brit Shaw) and their young daughter Leila (Ivy George). They move into a new home in Santa Rosa, California, and Ryan’s brother Mike (Dan Gill) comes to visit for Christmas. As Mike and Ryan dig through boxes left by the prior owners, they find an old video camera. To their shock, this allows them to see spirits that haunt the house, and this unleashes a variety of supernatural elements that terrorize the family. The old video camera that “sees” the ghosts offers the primary novelty in Dimension - and I find it tough to discern anything else to make the movie differ from its predecessors. Even with the added visual element, Dimension feels an awful lot like the prior Paranormal efforts. Actually, I guess it offers more “action” and menace than some of the other movies. My biggest complaint about the original film stemmed from its lack of much “terror” beyond general atmosphere. It felt like a whole lot of nothing punctuated with occasional “boo” moments. At least Dimension manages to become more dynamic than its predecessors, as it comes with more of those scare bits than in the past. While this means a loss of subtlety, it also alleviates some of the boredom that came with the prior flicks. But not all of it, as Dimension continues to feel like tedium punctuated with occasional jolts – we just get more of those than usual, and they’re more graphic. What was left unseen now appears in front of the camera, but otherwise, the terror stays the same. Actually, Dimension comes across as much more of a conventional horror film than its predecessors – and one with a lot of “parents”. The flick wears its influences on its sleeve – and pants leg, shoes, socks and hat. The Exorcist acts as an obvious source, but we also get bits and pieces from efforts like The Shining, Rosemary’s Baby and The Amityville Horror. All of this leaves Ghost Dimension as a forgettable attempt at horror. It does manage a bit more excitement than some of the other movies in the Paranormal Activity series, but it balances that with such an overwhelming lack of creativity that it winds up as a dud. Paranormal Activity: The Ghost Dimension appears in an aspect ratio of approximately 1.85:1 on this Blu-ray Disc. Given the visual parameters at work here, the movie offered a decent image. Quality depended on the “source”. Material shot with modern hi-def cameras looked quite good, with nice sharpness and clarity. Those elements suffered from no jaggies or shimmering, and they also lacked source flaws. For the hi-def footage, colors remained muted but fairly natural. They showed reasonably good reproduction, and blacks also seemed dark and tight. Shadows could be a bit dense – due to the shooting environments – but they usually seemed fine. Much of the film came from images altered to look like they were shot on 1980s home video equipment. Those portions weren’t filmed with ancient video cameras, of course, but they received post-production effects to create that appearance. This impacted sharpness – and everything else. Actually, the “80s video” showed reasonable accuracy, but these moments added fake scan lines that damaged delineation. These also showed a lot of jaggies and shimmering. The “80s video” didn’t come with source flaws, but colors looked flatter. This wasn’t an extreme, as the fake video came with a similarly low-key palette, but the hues were a bit less dynamic. Blacks also were inkier, while shadows were thicker. Ultimately, the transfer replicated the film as intended, but it came with too many unappealing visuals to merit a grade above a “B-“. 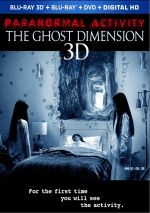 As for the film’s DTS-HD MA 5.1 soundtrack, it resembled audio heard for prior Paranormal flicks. That meant zero music, as the film lacked a score. Much of the material concentrated on general ambience, but the “scare moments” added decent use of the side and rear channels. In this case, that meant the spirits tended to zip around the room. These scenes didn’t pop up with great frequency, but they contributed a bit of pep and involvement to the proceedings. Audio quality seemed fine. Speech was natural and concise, without edginess or other issues. Effects showed good clarity and accuracy, and they boasted pretty solid low-end when appropriate. This didn’t become a demo-quality mix, but it seemed satisfactory. The package includes both the theatrical (1:28:03) and unrated (1:37:22) cuts of Ghost Dimension. Actually, it throws in the unrated cut with alternate ending (1:35:09) as well, but I’ll compare the “standard” unrated cut with the theatrical version first. For the movie’s first half-hour or so, the two versions remain nearly identical. We see one short sequence where Mike dons an ugly Santa mask, but otherwise, the versions stay identical. Once Leila goes under “nighttime video surveillance”, though, the cuts become much more different. At bedtime, Leila asks her mom if she “died” at birth, and we then see Leila as she wanders the house in a daze around 1 AM. Another sequence tells us that Leila bit a kid at school. The extended cut adds to the spooky events of Night 5, and another scene adds shots of Ryan and Emily as they find new material from the old videotapes. This cut elongates a sequence in which Emily sees spirits in Leila’s room, and a new piece shows more creepy/antagonistic behavior from Leila. After that scene, though, the two versions remain identical. This means that both movies offer the same material for their final 25 minutes or so. Does one version work better than the other? Not really. The unrated cut adds a bit more creepy material, but I don’t think any of it improves the film in a notable manner. Despite the extra spookiness, the end result feels about the same. As for the “unrated cut with alternate ending”, it duplicates the “regular” extended version until it gets to the 1:26:40 mark. At that point, it diverges down a totally different path – one that gives the movie a somewhat weirder but significantly “happier” finale. I might actually prefer it to the ending that finishes the other two versions. Normally I’d go for the movie with the darker elements but I think the semi-vagueness of the alternate ending works better. This package also provides both the 2D and 3D versions of Ghost Dimension. Note that the 3D edition only comes for the theatrical cut; if you opt for the unrated version, you’re stuck with 2D. I already discussed the picture quality of the 2D film – how did the 3D one look? Not as good, largely because the movie came with a lot of dark scenes that became even more difficult to see in the 3D transfer. Nighttime/shadowy shots could be awfully difficult to discern, and since so much of the movie featured those, image quality took a clear hit. In terms of 3D effects, the most active material came during the climax, as that part of the film made the best use of supernatural nuttiness. Earlier scenes added some footage in that realm as well, but the 3D became most prominent toward the end. I have to say that one negative aspect of the 3D comes from the way it violates the movie’s “found footage” aesthetic. Granted, that ship sailed with the first film, as all the Paranormal flicks come with many moments that don’t fit their contrived “reality”. Nonetheless, the use of 3D feels even less “real”. At least other components seem vaguely in touch with the “found footage” conceit, but because everything on display comes from video material, 3D makes no sense. Even if I ignore the ways the 3D violates the movie’s “realism”, the effects were lackluster. Honestly, much of the film remained 2D – and I mean that literally, as only the shots with supernatural elements used 3D. The rest were 100 percent 2D, which seemed like an odd choice – why not at least give us a little extra depth through the whole movie? When the supernatural bits occurred, they added some pizzazz, but they also tended to be gimmicky. The movie opted for some fairly cliché “in you face” bits most of the time, and these seemed cheesy. A few impressive shots did occur, but not many. All of this left the 3D Ghost Dimension as a disappointment. Too much of the movie remained 2D, and even when 3D effects occurred, they were lackluster and tough to see due to the movie’s darkness. If you like the film, stick with the 2D version – the 3D one flopped. The Blu-ray also includes Lost Footage. In total, these nine clips fill a total of 20 minutes, eight seconds. They show us more of the “archival” footage with Kristi and Katie, and we see additional shots of the Fleege family, with an emphasis on creepy moments. None of these clips feel important, though at least the shots of Kristi/Katie add a little more background. Note that the 3D disc offers an exclusive piece of “Lost Footage”. We find “WatchingLeila” (2:31), and it shows the scene in 3D – partly, as some of it remains 2D. It’s not much of a scene, unfortunately, as it’s just more of the usual pseudo-spookiness found in the final cut. A third disc offers a DVD Copy of Ghost Dimension. It includes only the theatrical version of the movie and it lacks any extras. With The Ghost Dimension, the Paranormal Activity series makes implicit spookiness more explicit. That seems like a good idea, but the film so blatantly borrows from so many superior movies that the end result falters. The Blu-ray offers acceptable picture and audio along with supplements like deleted scenes and alternate versions of the film. Maybe Paranormal fans will like this latest adventure, but it seems unlikely to entice new viewers.